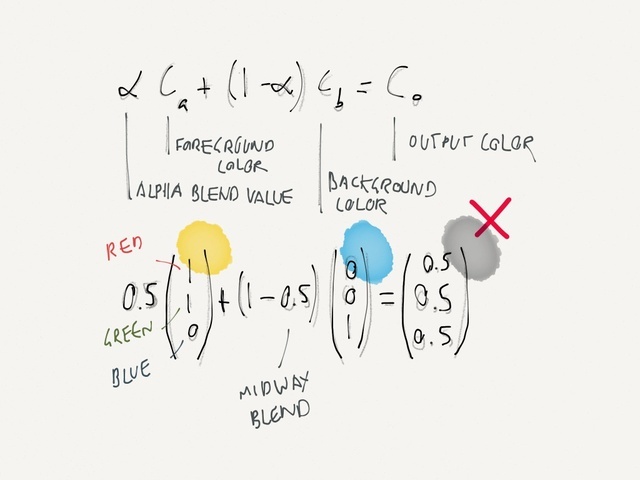 Paper by 53 (recommended app) now sports an innovative color mixer / color picker. Turns out it was quite a mathematical struggle to implement it too. We learned in elementary school that yellow and blue when mixed turn green. However when you plug in the values to this equation, you get a different result: Gray! Mathematically speaking, yellow (1,1,0) and blue (0,0,1), blend to the triplet (0.5, 0.5, 0.5) which is gray. This is because RGB only describes a point in a color spectrum, not how colors would behave when they blend.